Social life is essentially practical. All mysteries which mislead theory into mysticism find their rational solution in human practice and in the comprehension of practice. For a better understanding of what Karl Marx meant by the term alienation we will examine three of his early texts from the 1840s, “Contribution to the Critique of Hegel’s Philosophy of Right: Introduction” (1843-44); the “Economic and Philosophic Manuscripts of 1844” (hereafter the “1844 Manuscripts”); and the posthumously published “Theses on Feuerbach” (1845, published by Frederic Engels in 1888). We will briefly examine how Feuerbach’s critique brings Marx to his analysis of alienation. Then, using Marx’s descriptions, from his “1844 Manuscripts”, alienation will be further investigated in order to identify key moments of estrangement in the working life of laborers. Final consideration will be given to Marx’s VIIth thesis on Feuerbach, and its relation to alienation within the dynamic role of praxis. In Marx’s “Contribution to the Critique of Hegel’s Philosophy of Right: Introduction” there are opening references to Feuerbach’s critique of religion, whereby Feuerbach arrived at the realization that “man makes religion; religion does not make man.” This idea propelled Marx toward his own critique of religion (Christianity) which places man in an alienated relationship with a spiritual ideal that can never be fully actualized. Before Marx, alienation as a philosophical concept was dealt with in Hegel’s description of the way self-consciousness becomes self-alienated in order to become socialized, and ultimately, how self-consciousness knows itself (re: the absolute knowing of self-consciousness and Geist). Marx’s critical contribution, thanks to Feuerbach’s critique of religion and Hegel, was to emphasize that man’s labor is the origin of culture and society, instead of the other way around, whereby man is subordinate to the state and religion as it was according to Hegel. In order to critique capitalism, we need to comprehend such mystifications. Man is not a predicate of society, society is made by man. Marx’s aim was to critique Hegelian, Feuerbachian, religious, societal, and economic mystifications. This meant critiquing how things are in actuality, according to Marx and Engel’s incessant erudition, instead of appealing to traditional philosophical abstractions. A worker, entrenched in a capitalist circumstance, is encouraged to be productive, while his life becomes evermore devalued. Capitalist production not only produces commodities in the form of objects, but the laborer’s work also becomes a commodity, therefore, the worker is a dispensable commodity. Marx shows that the product’s value stems from the labor produced by human beings. The products, in-and-of-themselves, become alien, distant, and necessarily objectified from the hands that produced them. Yet, objectification itself should not be mistaken for alienation, since objectification is a necessary part of making things for human beings. 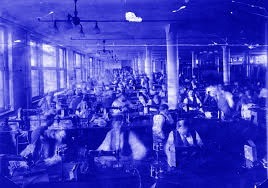 The phenomena of alienation comes about because the products and the worker’s labor’s are no longer his own. Production and its products are not controlled by the worker after the products leaves his hands. Alienation becomes more trenchant as the worker’s human-nature is detached from the private property born from his labor. Lastly, when we turn to Marx’s VIIth Thesis on Feuerbach, quoted above, we are immediately reminded of the theme of praxis (re: practice). Praxis has roots in Hegel as well as ancient philosophy. Marx felt that in order to understand the effects of alienation we have to understand the practices of capitalism. “The medium through which estrangement takes place is itself practical.” This suggests that to address the symptoms we have to know, and therefore, critique the causes of the alienation as it is made manifest in the working world. With the advent of new practices, new problems, and their accompanying concepts emerge. If we don’t actively expose the causes of the multiple problems surrounding the capitalist practices that enable and foster alienation, we cannot overcome the resulting suffering and careless oversight of existing conditions. For Marx understanding alienation makes way for revolution. All three texts are from: Robert C. Tucker, ed, The Marx-Engels Reader, New York, NY: W.W. Norton, 1972, 1978. Marx, “Contribution to the Critique of Hegel’s Philosophy of Right: Introduction,” The Marx-Engels Reader, 53. See G.W.F. Hegel’s Phenomenology of Spirit, (1807). “The only wheels which political economy sets in motion are avarice and the war amongst the avaricious—competition.” Marx, “1844 Manuscripts,” 71. Balibar, Etienne. The Philosophy of Marx. Translated by Chris Turner. New York, NY: Verso, 1995. Bernstein, Richard J. “Praxis: Marx and the Hegelian Background” in Praxis and Action: Contemporary Philosophies of Human Activity. Philadelphia, PA: University of Pennsylvania Press, 1971. Tucker, Robert C. ed. The Marx-Engels Reader. New York, NY: W.W. Norton, 1972,1978.